Allergic reactions don't just come from the foods we eat. 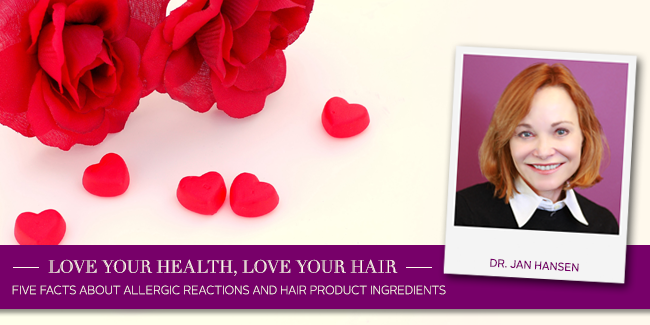 You can react to just about any substance - including the ingredients in your hair products. Dr. Jan and the team from Madison Reed offer some very helpful insight into allergic reactions and the ingredients in the hair products we use. 1. What is an allergic reaction? You could think of an allergic reaction as “too much of a good thing.” I say that because it’s a result of your body’s natural defenses working overtime. An allergic reaction is an inappropriate response to an otherwise harmless substance. When the body becomes sensitized to a substance, that substance becomes an allergen. Since this response depends on each body’s response, different people are allergic or sensitive to different things. Minor allergic reactions are common. In fact, some reports claim that up to one third of Americans have allergies. Most allergic reactions are minor, but some allergic reactions can lead to a severe life threatening reaction called anaphylaxis. The first time someone is exposed to an allergen, there is no reaction because the body hasn’t had time to develop antibodies meant to “fight off” the allergen. With each subsequent exposure, there is more of an immune response. This is why some people can, for example, eat shellfish or take penicillin or use hair dye their entire lives, and suddenly have an allergic reaction. The takeaway is to trust your body’s reactions. If something feels wrong, stop what you’re doing, even if it’s something you’ve been able to eat, drink, or use in the past. 2. Why are some people allergic to hair color? Allergens can get into our bodies in a multitude of ways, like eating peanut butter, breathing in pollen, through the blood when a bee stings, or topical like hair dye. It’s not well understood why some people react to certain substances while others do not. Let’s talk about common ingredients in hair dye that can trigger sensitivities. Much of the hair dye made today is still based on formulas developed during the Industrial Revolution. The most common chemicals in hair dye linked to allergic reactions are PPD, ammonia, and resorcinol. Knowing which ingredients pose a risk will help you make the best choices for yourself. Luckily, advances in science have led to healthier hair color formulas—like Madison Reed Radiant Color Kit —that give high performance without these common, potentially dangerous allergens. 3. Can I get hair color without these ingredients? Yes! Madison Reed permanent color is free of PPD, ammonia, resorcinol, added parabens, and gluten. And Madison Reed products do not contain any of the 22 chemicals that are banned in the EU, which has stricter safety standards for hair color. If you have high sensitivity to oxidative ingredients (which all permanent color requires to process hair), semi-permanent gloss is another option. This is a category of hair color that deposits pigments onto your hair without chemically opening the hair shaft. The tradeoff is that semi-permanent color cannot fully cover grays. Learn more about the difference between semi-permanent and permanent color on the Madison Reed blog so you can make a more informed decision! 4. How do I make sure a product is safe for me? If you have had an allergic reaction of any kind and know what you are allergic to, avoid the allergen completely. Repeated exposure to an allergen can lead to a more serious reaction. Always check a product’s full list of ingredients to ensure your safety. If you don’t know what you are allergic to, keep in mind you can be sensitive to any ingredient, not just the common allergens. The other important thing to note is that each color has different ingredients. So if you’ve been using one shade of color and decide to change your look, read through the new shade’s ingredients carefully. Don’t assume that it will be the same formula. If, and only if, you have not had a severe reaction in the past to hair color, you can perform a patch test on your skin before coloring your hair. Madison Reed offers a 100% satisfaction guarantee, so you can do this with their Radiant Color Kits with confidence. If you are going to a salon, call at least 2 days in advance to ask if they offer this service. If they do, make sure they perform the test with the exact shades that they plan to use on your hair. If you have had a severe reaction in the past, please do not test on your own. It’s best in those cases to consult your personal physician, dermatologist, or allergist. 5. How do I perform a patch test? 1. Mix a small amount of permanent color and a small amount of developer in a small non-metal bowl. You will be testing a very small patch of skin, so about 1” of color from the tube with a dime-sized dot of activator should be enough. 2. Clean small patch of skin (we recommend the inside of your arm, wrist, or behind your ear) thoroughly. Use rubbing alcohol if you are not sensitive to it. 3. Use a cotton swab to apply the color mixture to your skin. 4. Allow color mixture to dry. Then apply a small bandage to cover. 5. Leave on skin for 48 hours to test for sensitivities to the ingredients. If you sense any discomfort or sensitivity, remove and clean immediately. Patch test must be done 48 hours (2 full days) before you plan to color your hair. Skin should not get wet during the 48 hours. For this reason, behind the ear is usually the best spot. A visible change in the skin (redness or bumpiness) could signal sensitivity even if you do not feel physical discomfort. If you test on skin that is hard to see (like behind your ear), ask a friend to check at the end of 48 hours. Learn more about Madison Reed and their line of hair color products that are healthier for your hair! With more than 30 shades of permanent hair color, semi-permanent gloss and root touch up, there is a color for you! Find your perfect hair color now!